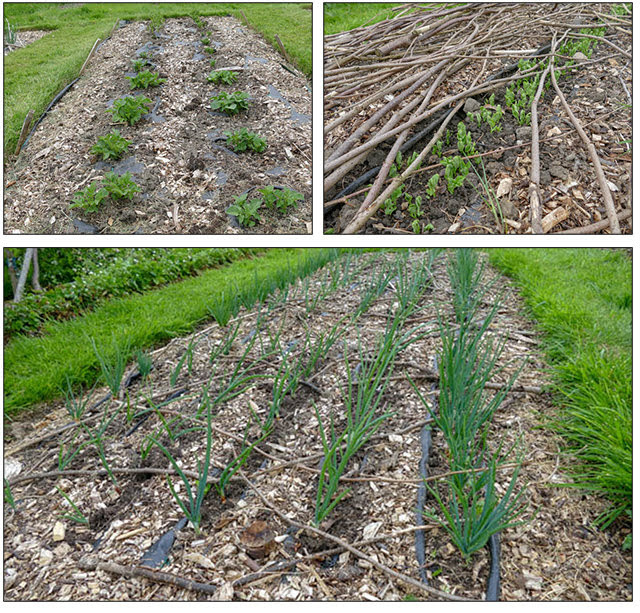 We had a token day of rain on Friday but not enough fell to make a difference on the allotment. Certainly not enough rain fell to release us from our watering duties so quite a bit of our time is spent lugging watering can around the plot. One day I clocked up a distance of 3.3km just carrying water back and forth. Our efforts carrying cans is so far being rewarded. The young parsnip seedlings are growing well and it seems that germination has been as good as I can remember. Soon I'll even have to thin the seedlings out whereas last year it was a case of sowing extra seeds to fill large gaps where seeds had failed . 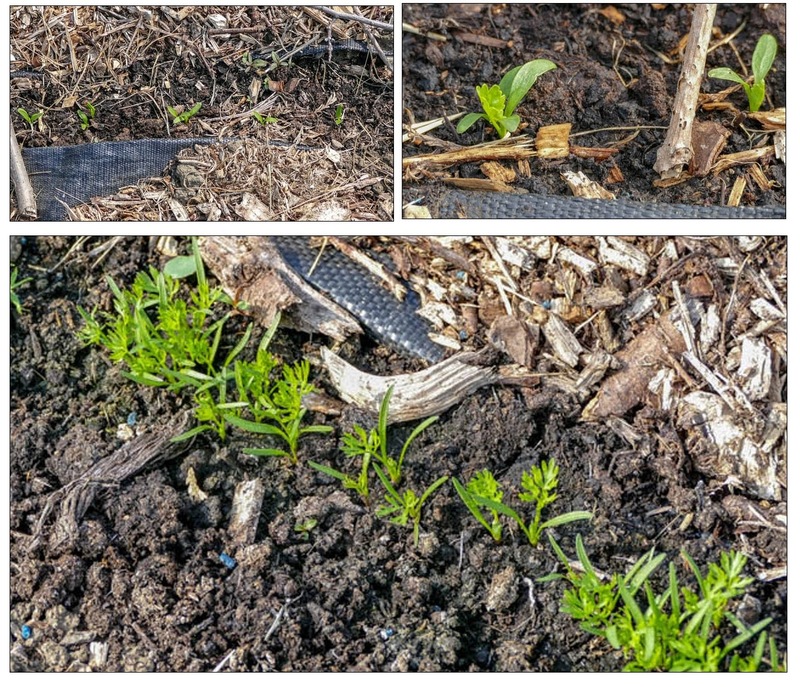 The carrot seedlings so far seem to have dodged the attention of the slug patrol and are beginning to produce true leaves. We are not out of the woods yet as those slimy assassins could still wreak havoc. The annual seeds that I sowed last week are coming through. More potential slug and snail fodder so no chickens are being counted. 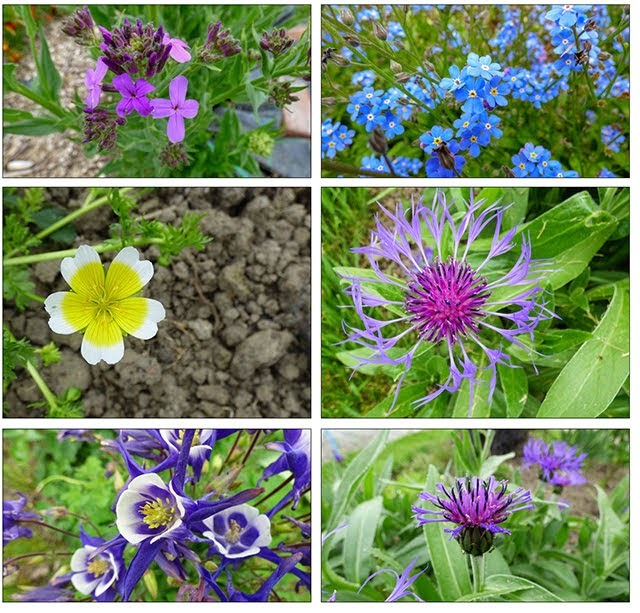 I planted small clumps of indoor sown dried flower mix and sowed more seeds alongside them. It will be interesting to see which method suits them best. The rest of the sweet peas have been planted out and more annual flowers seeds have been sown in front of them. 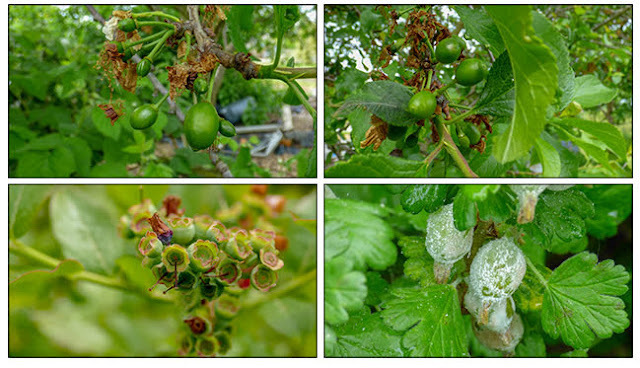 The tayberry, black raspberry and blackberry seem to be following the lead of the earlier fruit trees and bushes and producing lots of flowers and the bees are busily taking advantage of the bounty. I'm hoping the bees efforts are rewarded. The bees have plenty of chives flowers to enjoy should white flowers not take their fancy. As usual we sowed some green - Defender - and some yellow - Atena Polka -courgettes. If of these two, only one variety failed to germinate my money would have been on the yellow variety. I'd have lost my money, All the Atena Polka seeds produced good plants but not one of the Defender seeds germinated. In the photo above left, the empty cells are where young Defender plants should be. The Atena Polka have been planted out. We bought more seeds of a different green variety - Zucchini - and they have germinated. The runner and climbing French bean frame has been erected in readinesss for planting the beans which are currently growing on in modules in the greenhouse. Whilst working on the plot we often come across various amphibians. This week this little newt was spotted when preparing another bed for planting. As usual he or she was transported to a safer location. We regularly provide an amphibian taxi service. 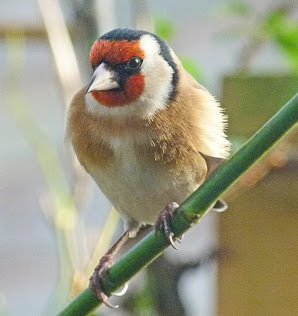 The bird feeders in the garden are very busy at the moment with parent birds busily trying to satisfy demanding youngsters. I'm hoping that this bullfinch dad has some young ones close by. Finally what have we managed to harvest this week. Not a lot! I did pick our first plot grown cut flowers of the year. The sweet rocket has a beautiful perfume. Of course there was more rhubarb but this time with a slight difference. The sticks at the top of the photo are Timperley Early which we have been pulling for a while but beneath them are the first sticks that we have harvested this year from Grooveless Giant Crimson. The Giant Crimson will be made into a compote to spoon onto our morning porridge. The rest of the rhubarb will be added to some stored frozen red cabbage to make an accompaniment to pork steaks. The only other harvesting this week has been of various herbs such as mint, coriander, parsley and sage which were picked in such small amounts that no photos were taken. As this week will see an end to May, I am hoping that shortly I will be able to report on a more varied harvest. According to my photo library, back in 2010 we planted up a couple of lavender hedges to border fruit beds on our allotment. Over time these hedges had become overgrown with weeds and despite being cut back every year were rather straggly. I wanted to keep the hedge as not only did they look good when in flower and smell wonderful but it is much loved by insects. However, it desperately needed some attention and so a few days ago I decided to try and tidy it up. Below is a video of my attempt at renovation. It explains that things don't always go to plan. A few flowers and a wander around the plot. So far this year has been a bit of a battle garden wise. Last month we were gardening - or should I say trying to garden - in mud and wishing that the ground would dry out so the beds could be prepared for this year's crops. I guess we should be careful what we wish for as the change of weather in May not only dried the soil but baked it hard. 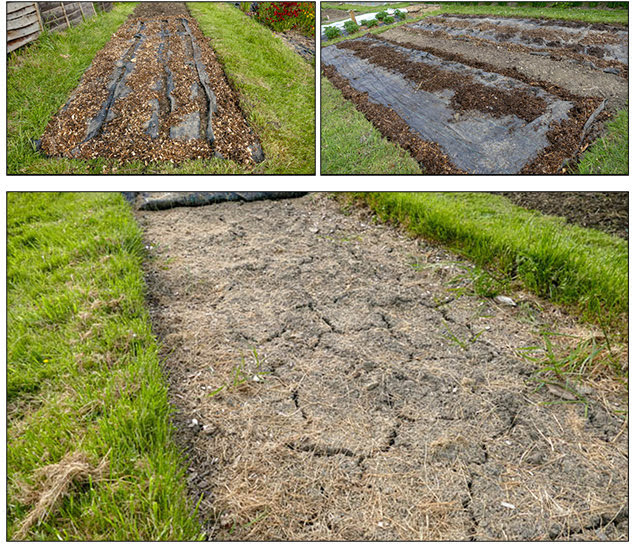 Some beds were prepared during the brief period when the ground was workable but now it is proving almost impossible. Martyn has managed to knock some beds into shape but it is taking a long time and is very hard going. 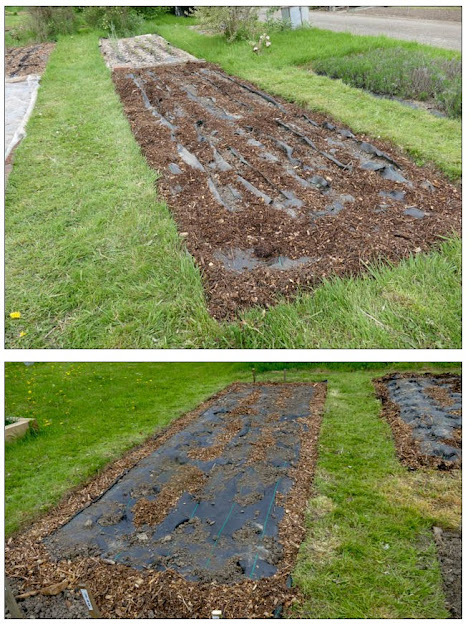 We took all the weed control fabric off the beds to allow some drying to take place - now we wonder whether that was a mistake. On top of all this last week a frost was forecast for a couple of nights so we took a couple of precautions. 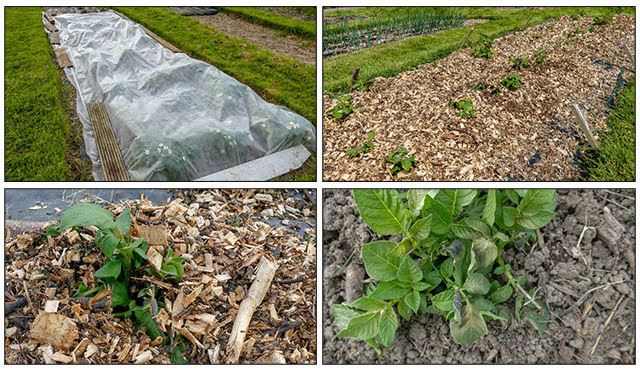 Strawberry plants that were in flower we covered with fleece, potatoes growing without weed control fabric were earthed up and those growing through fabric were covered with wood chippings. The temperatures briefly dropped to 2.2C (36F). We thought we had escaped any damage but the potatoes grew through their covering and some seem to have been nipped a little. We are unsure of whether the problem is frost damage or the result of excessive dryness. We have given them plenty of water just in case. In fact we spent much of Sunday watering and now have arms a foot or so longer due to lugging heavy watering cans about. Most of the fruit like the greengages, plums and blueberries have set lots of fruit and have obviously enjoyed the conditions. The carrots and parsnips are germinating fairly well but in need of constant watering as are all the seedlings. I just hope that the slugs and snails keep their distance. Must admit that, this year, the parsnips seem to have started germinating faster than I expected. The first lot of peas had grown enough to need supports and we have sown another two rows of peas and a couple of rows of mangetout and sugarsnap peas. The circles shown in the photo above right are sown with beetroot and chard. The first lot of sweet peas have now been planted and the rest are waiting for a bed to be ready for them. Back at home the watercress is now flowering profusely. Reading up on this it seems that the leaves become bitter after the plant flowers. Can anyone confirm this. If this is the case I suppose it will have to come out and more started. 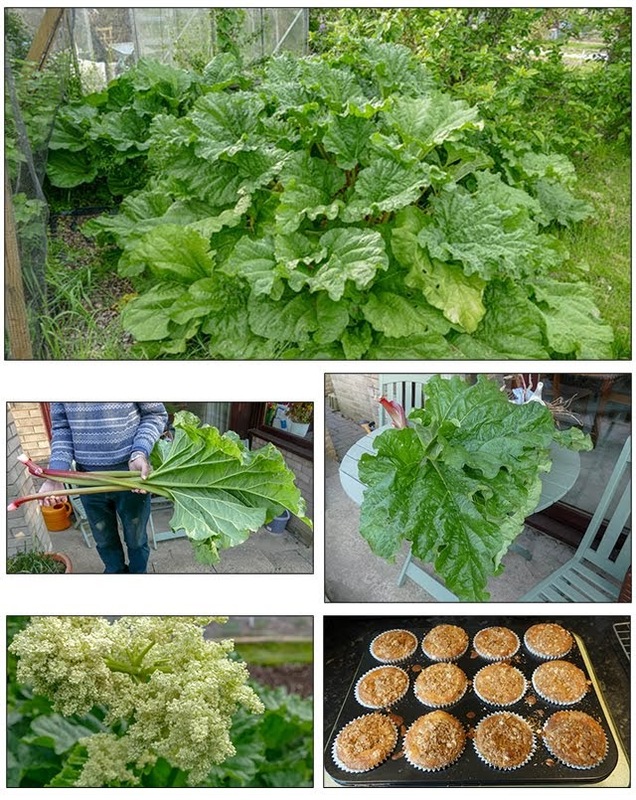 All our rhubarb has grown well this year and some clumps are now sending up more unwelcome flowers. These have been removed. Just one of the stems above were used in the batch of Rhubarb Crumble Muffins that I made this week. Some of the rest was stewed to add to our morning porridge. Things are starting to move on our allotment plot. Fruit is setting. As well as the honeyberries, pears, apples and jostaberries shown in the photos below, plums, greengages, and the various currant bushes have set fruit. 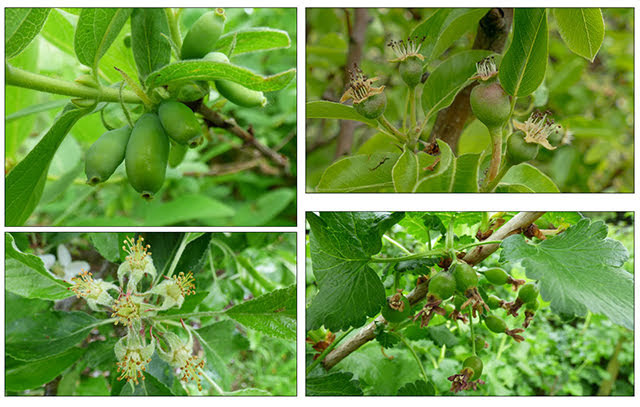 Whilst some fruit has already set other trees and bushes are flowering. 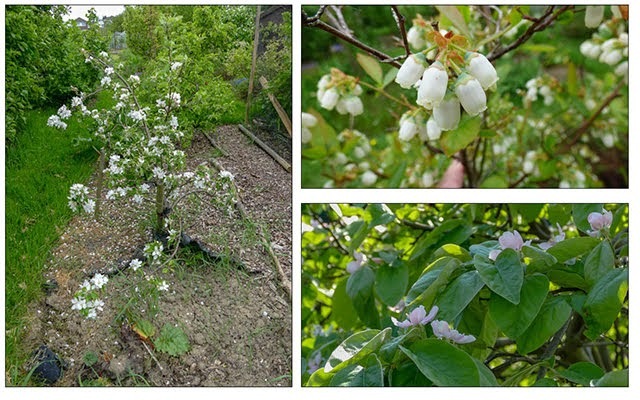 Shown below are later flowering apples, blueberries and quince. All have lots of flower which I hope will convert to lots of fruit. It's not only the bushes and trees that are sporting flowers. The first lot of broad beans are flowering and the earliest varieties of strawberries also have lots of flowers. With potential frosty nights forecasts I only hope the flowers are not spoiled. You may notice that the bean leaves have the tell tale notches that show bean weevils have been lunching. The pea shoots are also their favoured food but hopefully the plants are growing quickly enough to shrug off the damage that occurs every year. It is only a problem when the weevils munch faster than the plant grow. There are plenty of ornamental flowers putting on a display too. The forget-me-nots have been strutting their stuff for weeks but others are just coming into their own. Under the plum trees are a couple of large clumps of bluebells. Unfortunately they are Spanish and so lack the gorgeous scent but they provide a pretty display and as there are no nearby English bluebells to cross pollinate we are happy to have them. Martyn managed to till more beds. It was hard going but he persevered so that we had some areas ready to plant up. I sowed a half a bed of hardy annuals. The other half will be sown a little later for succession. 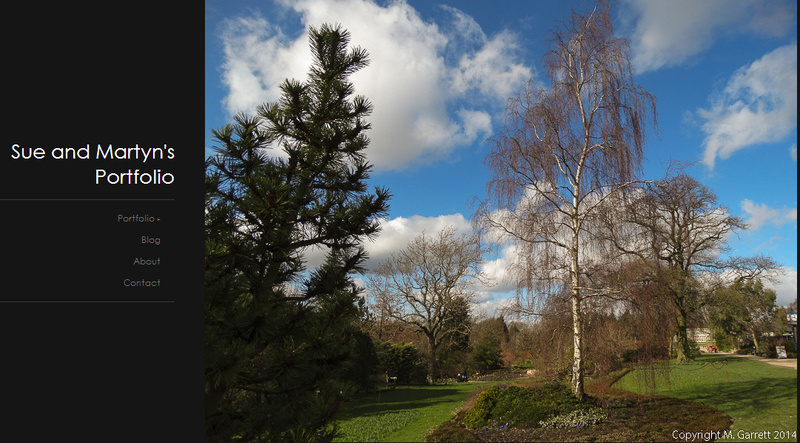 The area at the far end of this bed is where I planted the overwintered hardy annuals. You may remember that I had to sow these in modules last year rather than direct. The conditions meant that they were very late to be planted out and were consequently weedy looking plantlets. I'm afraid little has improved. Actually considering the weather we had I'm not sure a direct sowing would have fared any better. We were really pleased to have managed to plant the last of our seed potatoes. The earliest planted potatoes are well through which is a happy and a worrying event in equal measures. As I mentioned before frosts are forecasts for some nights later in the week. The first lot of peas are also growing well and will soon need staking with hazel twigs. It's probably time to get a second lot in. The recent sunny, dry weather has meant that lots and lots of watering is required. The onion and shallots are growing really well. I am convinced that had we started the sets in modules they would have done no better at this stage and it certainly freed up greenhouse space. Some beds have required some adaptation. The bed below has been divided into two. We needed to walk on the beds to harvest and tended to always trudge along the same route creating a hard pan so a path will now be created down the centre. The bed below will have climbing beans at either side of the path. We have 'ancient' lavender hedges around some of our fruit beds. 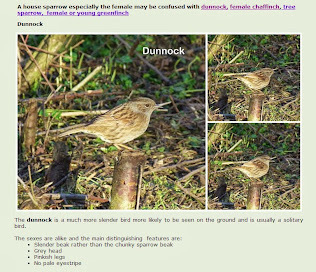 These have become infiltrated with grass and are also very straggly looking. My plan was to dig them up and replant them deep in the soil. This has proved to be impossible - the plants just will not come out of the ground without damaging the closely planted quince and blackcurrant bushes so plan B has been put into action. This is to remove as much grass as possible and prune the bushes back as hard as I dare. Any spaces left between the remaining plants will be filled by what I hope will be plants grown from rooted cuttings. Despite the dry weather the grass is growing quickly and so some time each week is spent strimming to keep it and the many dandelions that try to colonise the grass in check. Dandelions have a fascinating habit. The closer the grass is cut the shorter the flower stems grow until the flowers are virtually stemless. Of course we are still pulling rhubarb, although rhubarb isn't a fan of the type of weather we have been experiencing. If the clumps start to flag we may need to think of pulling some to stew and freeze. At the moment the sticks are things of beauty, unlike the flaccid anaemic looking specimens being sold at the greengrocers.